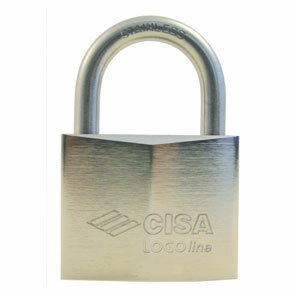 Cisa Logoline Marine Padlocks offer security and tarnish resistant properties. Padlock body made of solid brass and chrome plated, shackle made of stainless steel. High precision quality and manufactured in Italy. Available in several different sizes. Shackle has two locking balls and is double locking. Cisa patented anti-tampering protection device. Pick resistant brass plate. Key Retaining. Supplied with two keys. Available in Keyed to Differ or Keyed Alike.